I've got a cross bike that I use for off-pavement riding and commuting. 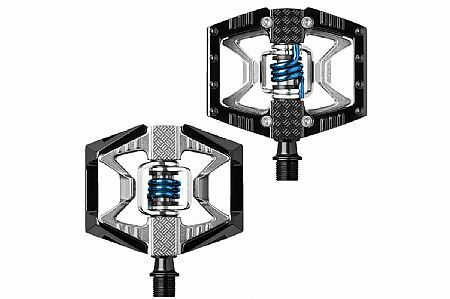 I was switching pedals back and forth between Crank Bros Quattros and clips on my Sidi Dragon shoes and flat pedals with toe clips and straps and regular shoes for commuting. I got these Crank Bros Doubleshots to avoid having to change pedals so often. Getting the Sidi shoes onto the clips is not easy - first, have to get the pedal to the correct side, and second, securing in the clip has not been reliable, as it was with the Quattros. This was a problem riding on some hilly two-track yesterday - could not quickly engage on uphill start-ups. The flat pedal sides have a good grip, but without toe clips, can't pull the pedal up to start at stop light, and my feet have gotten dislodged going over bumps. Overall, I will probably keep these for the benefit of not having to change pedals for different rides, but so far, neither side of the pedal works as well as the two pedals I had before. Compromise. Great pedals for flats and clipped in. The platform side grips well to shoes and boots, but oddly mtn. bike shoes slip right off. The cleat side is like any crank bros. pedal, easy in easy out. It's an affordable option to the downhill version. Quick trips to the store without changing shoes and longer rides with secure pedaling are covered with one pedal. Maybe you have a long commute and want to clip in and maybe sometimes youre heading to neighborhood cafe or pub and just want to get going. These are the perfect pedals for this scenario. Give it a shot or make it a double.